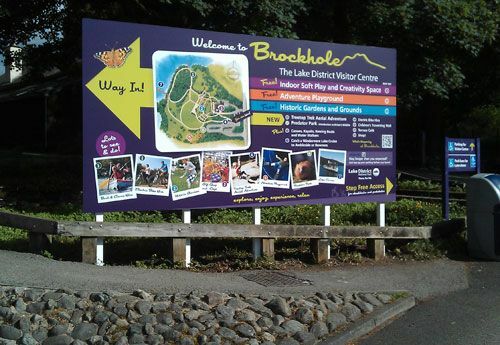 The Brockhole Visitor Centre is developing its visitor experience and required signage to highlight the new attractions. The design needed to be attention grabbing and to display the information clearly. The five metre wide sign featured a map and photography from each of the highlighted areas. ‘Free’ attractions were marked clearly as well as access points for pushchairs and wheelchairs. The work was commissioned by Cairn Marketing Consultancy and printed and installed by Ormrod Signs.